Much activity on my workbench this week, with a frankly intimidating number of figures under the paintbrush, along with some other stuff like a set of the luggage I got a while back. Deliberately bad photo – see the next few weeks of LPL7 entries for what’s hiding behind the dragon & the paint jars! However, given that I’ve committed to the Lead Painter’s League 7 contest for the next eight weeks or so, you’ll have to forgive the line of paint jars obscuring most of the really interesting stuff on the bench! The dragon, cave men and captive have been lurking in the back of my bench for ages, so I moved them to the front to show them off a bit! The dragon is from Reaper and probably mostly done, unless I decide it’s entirely too blue and head back to the drawing board. The cave dudes are Copplestone; their captive is from Pulp Figures. The figures in behind are from… mostly Pulp Figures, actually. You’ll have to follow my progress in the LPL over on LAF to see them sooner than here! 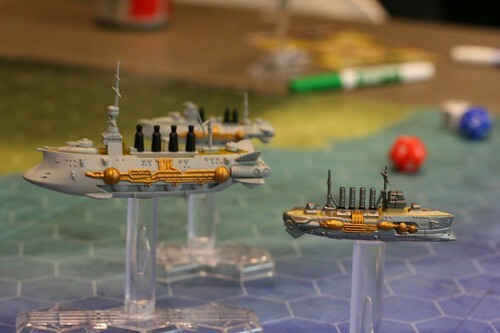 Martin, an long-time friend who now lives in Vancouver, has been slowly posting his photos from the recent Trumpeter Salute gaming convention. As I mentioned in my writeup, he’s got a significantly fancier camera than mine, a fairly recent Canon DSLR, and he also hauled a lightweight tripod to the show, so many of his photos are really excellent. Bolshevik forces laid out before setup. Cavalry & armoured car, then the Red Sailor platoon, then a mixed platoon of Red Militia and Red regulars. The Red’s left flank as the game begins. The sailors on the extreme left have already started to advance. Martin’s entire set from my Even Whites Bleed Red Russian Civil War game is over on Flickr. 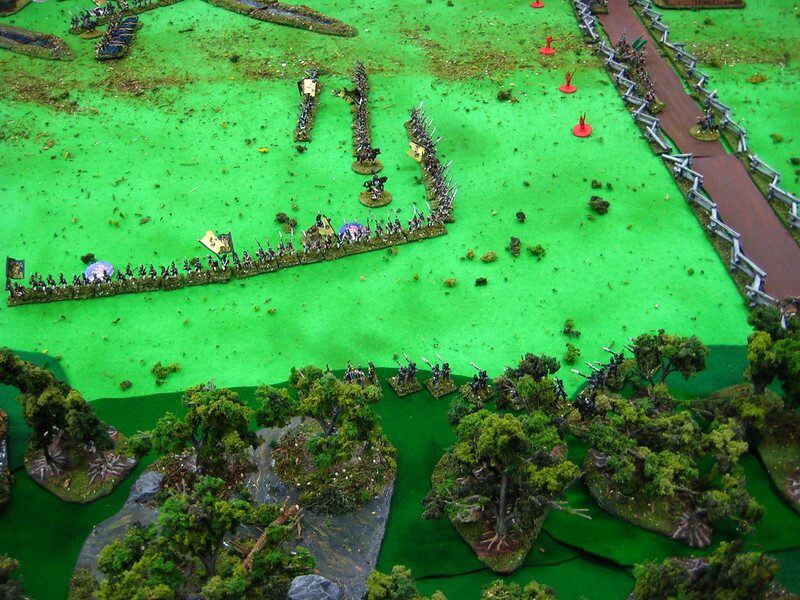 He’s also got some good photos from the War of 1812 game we both played on Sunday. Another semi-random collection of links to things that have caught my eye recently! Got a nice box from J&M Miniatures earlier this week, and even before I cut the tape on the box I could smell the future… oddly enough, the future (of wargaming scenery) smells like scorched MDF. Laser-scorched MDF. Specifically, a whole whack of 4Ground’s wagons. Corey had ordered approximately enough wagons to provide logistics for an invasion of Russia (well, OK, six…), which he might get around to showing off here at some point, and I’d tagged a single extra General Purpose wagon onto his order. I’ve previously reviewed 4Ground’s Generic Horse Cart, so it was nice to get my paws on the cart’s larger relative, the GP Wagon. In the ziplock, you get a single 8″x5.25″ sheet of 3mm MDF full of laser-cut wagon parts and a single double-sided sheet of illustrated instructions. That and a dab or three of white glue are all you need to turn out a very nice wagon. 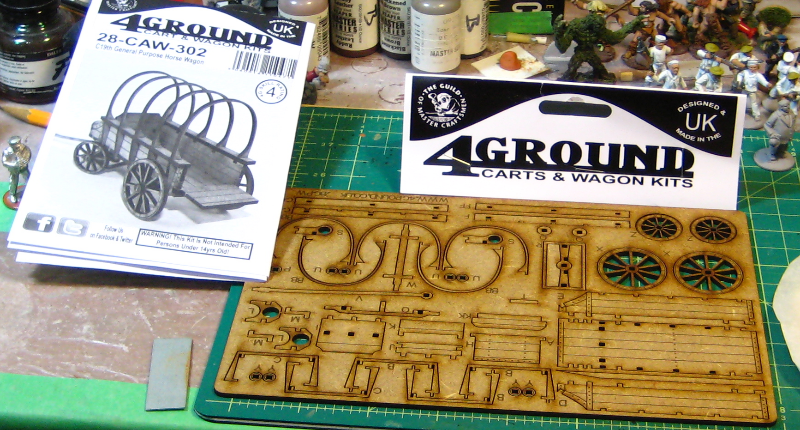 4Ground’s General Purpose wagon, still in MDF sheet form. Wagon mostly finished, upside down so I can get the wheels in place. The GP Wagon is a bit more involved than the Horse Cart, but everything is very precisely cut and well engineered. 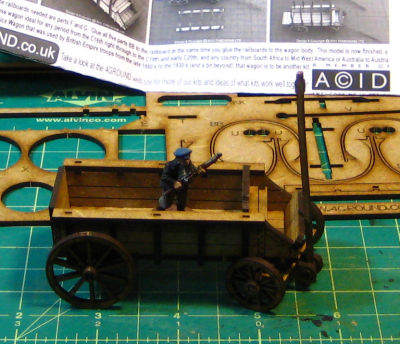 I’ve built injection moulded plastic kits that fit a LOT less precisely than this MDF wagon does! The only time I found the photograph-illustrated instructions less than clear was when beginning assembly of the front axle/steering assembly, but a bit of dry fitting reveals that the pieces really only go together one way, which makes it hard to really screw up. 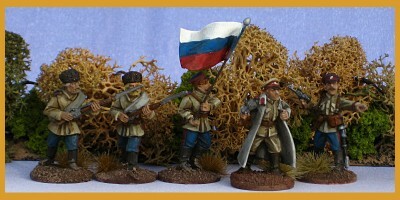 Finished, with the wagon pole pivoted vertical and a 28mm Copplestone Bolshevik militiaman for scale. You have the option of adding canopy hoops over the bed of the wagon for the classic covered wagon look, but I elected to leave them off this one. The next will probably have hoops, just because! The finished wagon is just over 3″ long (6″ including the pole), about 1.75″ wide across the hubs, and about 1.5″ tall. You can fit three figures on 20mm bases into the back, two if you use oversized 1″ bases. I’ll probably paint both this one and the Horse Cart eventually, but even in bare MDF they look pretty good, with the dark laser-burned cut marks providing nice contrast to the normal honey-brown MDF. Corey has already done a nice report from the field on his gaming Friday evening, with some great photos, but here’s the rest of the weekend from my perspective! We headed over from Victoria Friday afternoon, making good time and even seeing orca whales from the ferry, which I haven’t seen in years. 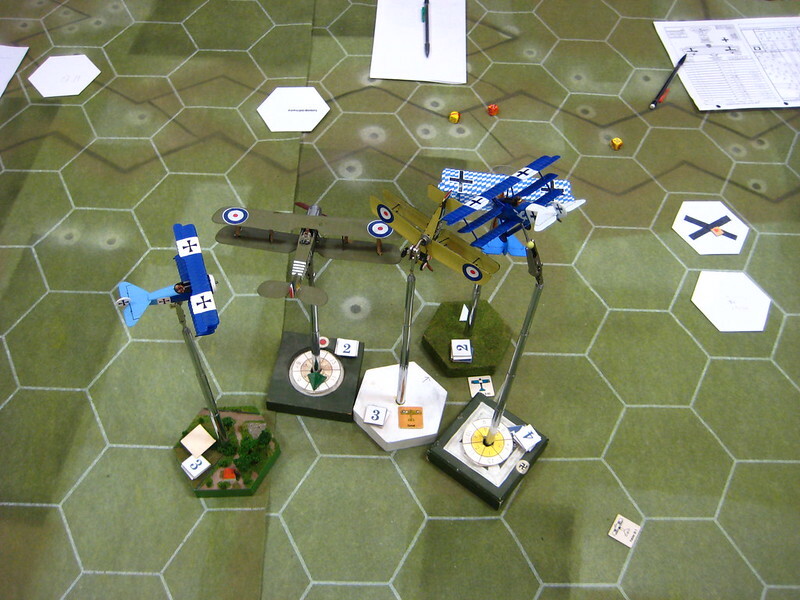 Friday evening I spent flying in Rene’s perpetual World War One air combat game. I was doing fairly well until a Fokker Dr1 slipped in behind my Camel and blew me away in one savage burst! Smoked Camel! 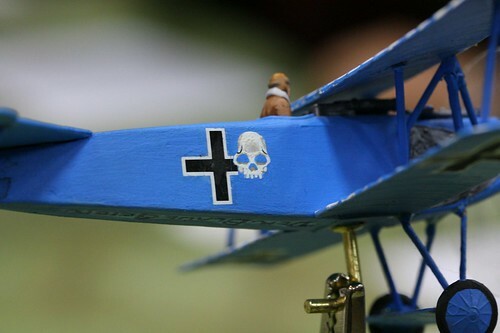 Attempting to defend a Brisfit bomber, I let a Fokker Dr.1 triplane slip in behind me and he blows my engine clean off it’s mounts! Click to view larger over on Flickr. Saturday turned out to be “Soviet Saturday” for me! I played the 30mm Dust Warfare skirmish system with Martin (an old friend) and his nephew Riley (this was Riley’s first gaming convention!) and another gamer in the morning, Weird War Germans vs Soviets over cardboard ruins Martin and I had been up until 2am assembling! It’s a fast system with some interesting features, and I want to have another bash at it at some point. 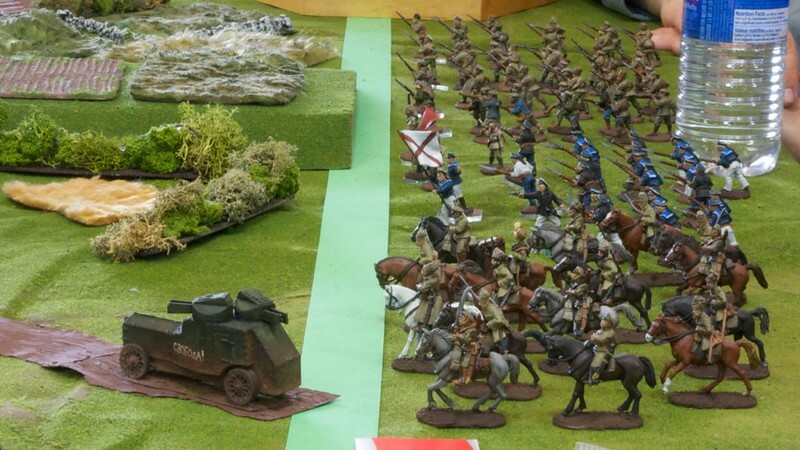 Saturday afternoon it was time for my big Russian Civil War game, with a full set of six players and loads of toys on the table – the White Russians had a SPAD XIII for air support and a field gun, while the Reds had a huge horde of cavalry, an armoured car and an armoured train! The cavalry did better this game than they have ever done before, completely shattering one wing of the defending White force by themselves. Red forces advance! 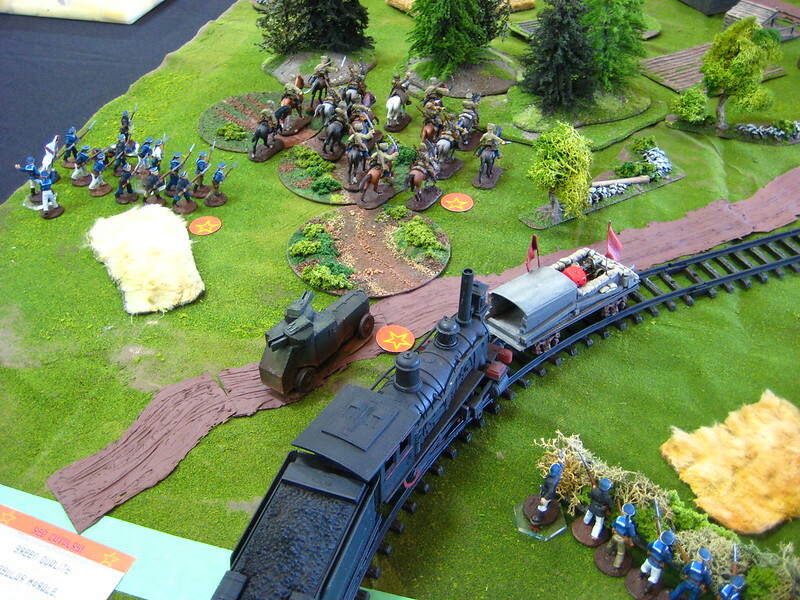 Sailors on either side of the train and armoured car, and a huge Red cavalry unit in front, heading towards the woods! We rounded out Saturday evening with more Russian-German action, this time a WW2 Eastern Front scenario of a scratch Soviet force trying to hold off flanking attacks by German panzers. The 15mm figures and vehicles were really well done, and the terrain was elegant. It was a close fight, with the Germans losing a fair number of tanks to Soviet infantry but being positioned by the end of the game to push their untouched reinforced infantry units into the Russian villages with their remaining tanks in support. Sunday Martin and I played Colin’s very nice and well-run War of 1812 scenario, a re-creation of the Battle of Crysler’s Farm 200 years after it actually happened. I played the invading Americans with two other gamers, and we got our asses absolutely handed to us by the British/Canadian/Mohawk defenders. Nevertheless, we apparently did better than the Americans had actually done historically – we did manage to drive one of the two big British infantry regiments from the field, but the effort wrecked my brigade, while Canadian militia light troops and British cannon drove the rest of the Americans off! The Americans advance confidently toward the British-Canadian defenders. A few turns later they’d be lurching backward in a considerably less controlled fashion! 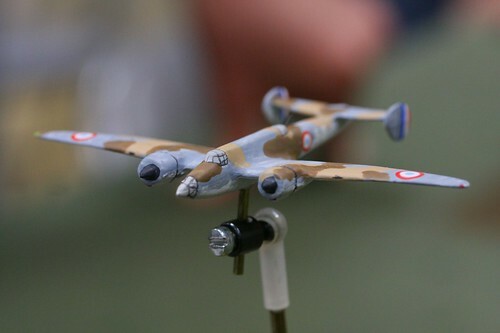 The rest of my twenty photos from Trumpeter Salute 2013 are over on my Flickr account. Corey and Martin (who both have more capable cameras than I do!) both took more great photos, so I’ll try to get some of those up here on the Warbard soon. Trumpeter Salute, the best annual miniatures convention on the west coast of Canada (sorry, Gottacon. Your relentless focus on GW turns me off) is happening again this weekend and I am again reminded of why I come to conventions: to be inspired. This evening found both Brian and I playing aerial games, although he had considerably less success with his World War One 1/72 than I did in Leviathans, where I fairly handily destroyed a British aerial cruiser and destroyer. Our third member, recovering GW player Sean, was evolving. Or something involving tails. I didn’t ask. And the spending has begun. I picked up some Saxons for my eventual Dux Brittanium, Sean some ECW/30 Years War and Brian also managed to spend a great deal of money. And we haven’t even hit Pulp Miniatures yet. More photos tomorrow, including of Brian’s RCW game.